A country skillet breakfast meal, often called Farmer's Breakfast, made with fried potatoes, onions and peppers, eggs, sausage, ham or bacon, and cheese. Makes a great breakfast burrito filling. This is a great breakfast meal, but honestly, it's just as good for brunch, lunch or even breakfast for dinner, and makes a great filling for breakfast burritos, a popular addition to the once a month cooking forum I used to frequent back in the day. I'd make a batch of breakfast burritos and wrap them up to keep in the fridge for those busy mornings, making them a great make ahead meal for those hurried school mornings, especially for teenagers who might be more prone to stopping at the corner store for sugar laden sweets on the way to school instead. The burritos are convenient because they can also be frozen, though some potatoes can be iffy for the freezer, because they will suffer a change in texture and become mealy and grainy. I recommend using red potatoes if you plan to freeze these as burritos, which seems to work a little better. If you want to make a big batch for the freezer, you may prefer to omit the potatoes and simply double the other ingredients. Of course, this dish stands on its own too. 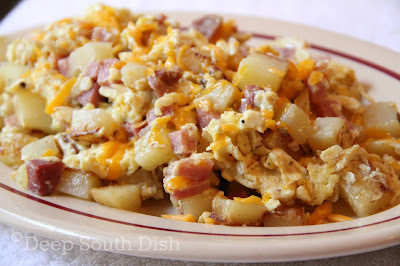 You'll start with basic skillet fried potatoes with onions, and add in some smoked ham, or cooked breakfast sausage or bacon, plus eggs that you'll scramble in, and of course, cheese - all ingredients that make for a hearty country breakfast. Customize it to your liking by adding in sauteed sweet or hot peppers, mushrooms, changing the meat, whatever you like, and yes, of course you can even make it a little healthier with a few minor changes. Add some fresh, seasonal fruit on the side and it's really a meal in one, although a side of buttered toast, or hot, homemade biscuits would be nice, especially if you add in some country gravy. I like a little dab of salsa with mine. Here's how to make it. In a large skillet, cook onion and peppers in butter till tender. I left out the bell peppers this time because, well, when I decided to make this, I was out. Add peeled and cubed potatoes and season to taste with the salt and pepper; stir, cover and cook over medium heat for 10 minutes, without stirring. Meanwhile, beat together the eggs, milk, Cajun seasoning and ham, or you may also use cooked sausage or bacon. I had some ham chunks in the freezer, so that's what I used today. Pour the mixture over the potatoes and cook over low heat, without stirring, until eggs begin to set on the bottom. Lightly stir and turn eggs to shift uncooked eggs to the bottom and cook gently until eggs are cooked through, but still a little shiny and wet. You don't want to overcook them dry. Taste, adjust seasonings as needed, and stir in half of the cheese, transfer to plates or serving platter, and top with remaining cheese. Serve immediately. For more of my favorite breakfast and brunch recipes, visit my page on Pinterest! In a large skillet, cook onion and peppers in butter till tender. Add potatoes and season to taste with the salt and pepper; stir, cover and cook over medium heat for 10 minutes, without stirring. Meanwhile, beat together the eggs, milk, Cajun seasoning and ham. Pour over potatoes and cook over low heat, without stirring, until set on the bottom. Lightly stir and turn eggs to shift uncooked eggs to the bottom and cook gently until eggs are cooked through, but still a little shiny and wet. Don't overcook. Taste, adjust seasonings as needed, and stir in half of the cheese. Transfer to plates or serving platter, and top with remaining cheese. Serve immediately with a side of fresh, seasonal fruit. Cook's Notes: May serve as is, or use as a filling for breakfast burritos. Save time using frozen, cubed potatoes and/or vegetables. If you don't use the Cajun seasoning, season eggs with additional salt and pepper, to taste. Add seeded and diced tomato, mushrooms and other favorite omelet ingredients. May substitute bacon or sausage for the ham, if you prefer. Cook it off first, remove and set aside, adding it back at the end. Make Ahead Breakfast Burritos: Warm 6 flour tortillas and distribute egg and potato filling evenly among each. Divide the remaining shredded cheese on top of each burrito and roll up. Wrap rolled burritos individually in plastic wrap and place into a covered container or storage bag. To heat, remove wrapping, roll in a paper towel and warm in microwave, about 1 minute. To Freeze: Potatoes can suffer texture change when frozen and become grainy and mealy. Leave them out and double the eggs, meat, vegetables and cheese. Roll and wrap in aluminum foil, parchment or freezer paper, then place into a freezer bag. To reheat, remove from freezer wrapping and wrap burrito in a paper towel. Microwave on defrost for about 2 minutes, then 1 minute on high, or warm wrapped in foil in a preheated 350 degree F oven wrapped, for about 15 minutes, or until warmed through. Microwave times will vary. Deep South Skillet Breakfast: Heat 1/2 tablespoon oil in large skillet. Toss in 1/2 cup chopped andouille sausage and 1 cup chopped, raw shrimp seasoned with 1/2 teaspoon Old Bay seasoning. Saute until shrimp is no longer translucent, about 3 minutes. Remove from skillet and set aside; proceed with recipe, returning shrimp and sausage to skillet with the eggs. Looks delicious Mary and this type meal is one of my favorites. Less the eggs, we had about the same meal last night for supper in the Black Hills. We had potatoes, onion, peppers, leftover grilled brats, and leftover cooked breakfast sausage - right tasty eaten outside around the campfire - needed a little cheese though. A little cheese is always nice Larry! Ha! I bet you did!! It's a great throw together though isn't it? We love it for dinner! That is a platter loaded with goodness, the perfect cure for a hangover! I would just like to say a hearty thank you for your blog. Because of you my husband has faith in my cooking again! I have been a fan of yours for a little while now but I wanted to take a moment to thank you!! knew how to cook before but I am a L.A. girl with a deep south husband. We may make a great couple but I can tell you from experience the two just dont mix at the dinner table! Thanks again! Hi Jerie!! Thank you so much for taking the time to stop by and leave such a sweet note to uplift me this weekend. I really appreciate that!! It sure helps on those busy morning doesn't it?!! Several years ago, I tried something a little different that’s actually made my life a little easier; especially when the kids come. They eat and sleep and grandma watches the baby while grandpa cooks. It’s all good and we’re very blessed. Sometimes I cheat and use southern style hash browns. I cook them along with the peppers and onions and then turn them out on an extra large well greased sheet pan. I pour the egg mixture over that and top it with finely shredded cheddar cheese. Pop that into a 350 deg. oven for about 20-30 min. Heat the tortillas and keep warm. Now here’s the best part. When I’m ready to plate, I portion and cut the eggs with a pizza cutter and slide them out with a long narrow spatula. It’s served with what my son-in-law calls “The ketchup of the South:” Frank’s Louisiana Hot Sauce. BTW, I’ve tried freezing these. Trust me, it doesn’t end well. I don’t know how long you can keep them refrigerated. When the kids are here, everything in the fridge only has a life span of less then 24 hours. I'm loving your wife every day more and more lol!! Loving that tip for the pizza cutter too. I have made this dish since I was a starving college student nearly 40 years ago. Its a family staple for Saturday morning and many a breakfast for dinner meal. It's better now that I've learned your steam fried potato method. A lady my wife works with has chickens and charges $2.00 a dozen if you return her cartons. There is no comparison between farm fresh eggs and those months old white orb things from Walmart or Kroger. The taste and texture difference is night and day. Glad to help Richard! I completely agree with you about farm eggs. We had a source that my husband knew that I'd buy from but that dried up a few years back and don't know anybody else who has chickens. Sure would like to find somebody though. I've thought about backyard chickens but that's as far as that got! Too many possums & raccoons around here. Huh. Was on Pineterest researching what I was going to do with the leftover juicy drippings from making your Whiskey glazed ham, and it suggested this recipe? Don't know why, but it sure looks good enough to try!